Let us show you everyday Poland, its people and the lesser-known places which hold great charm for Poles. For connoisseurs who have already fallen in love with Poland. Morning: After breakfast we set off from Krakow on our journey to the east of Poland. The first stop is Mt. Zar, where we take a cable car ride for a vista of the beautiful Beskid Maly landscape. Afternoon: The next stop is Zywiec and the Brewery Museum (opened in 2006), a very interesting place even for non-beer drinkers. 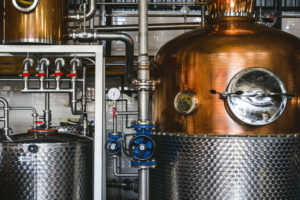 You will see the modern process of beer production, a model of the brewery and old workshops. Beer tasting can be arranged. Evening: We arrive at Lanckorona, hidden in the Beskidy mountains and check-in at local hotel. Dinner and overnight stay. Morning: First point is a walk in charming little village Lanckorona. Its local architecture has been kept since 19th century. We will visit local small museum and discover some very nice examples of wooden architecture. Later on we will leave the area of Beskid Maly and head further east to visit the Nowy Sacz Etnographic Park that is famous for its wide range of regional folk architecture and their interiors. 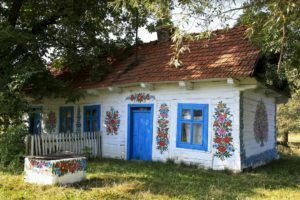 Afternoon: We continue to one of the most homely spots in Poland – the village of Zalipie, where all the houses are painted in colourful floral motifs. We will visit local cultural centre and discover more interesting facts about Zalipie. Evening: We reach Tarnow, where we will stay for the next two nights. Dinner and free evening. Morning: The first stop is in Debno, the site of an exquisite wooden church dating back to the 16th century (a UNESCO World Heritage Site). Next, we move on to the picturesque gothic Niedzica castle situated by Lake Czorsztyn. Afternoon: We continue our adventure with a rafting trip (2.5 hrs.) 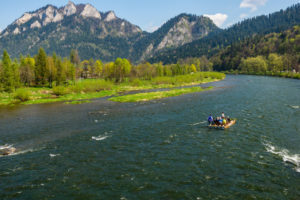 down the scenic Dunajec river gorge, meandering gently along the Polish-Slovak border through the Pieniny National Park. The rafts are comfortable and safe. Similar in design to a punt boat, the rafter propels the vessel forward with a long pole. Millions of years ago the river made its way through mighty limestone rocks. Visitors are drawn here by the spectacular views. After the trip, we visit a charming Renaissance castle in Nowy Wisnicz. Evening: We return to Tarnow for one more night to enjoy a lovely dinner and get some rest. Morning: We set off again in the easterly direction towards the famous Renaissance palace in Lancut. Afternoon: A visit of the splendid interiors of the 17th-century palace in Lancut. Another must-see is the museum located in the local vodka distillery next to the palace. We will learn more about the drink that has enjoyed a long historical presence in Polish culture. On the way to Zamość we will have a short stop in lovely small town Lezajsk, where you will find out a little bit about Jewish history in Poland at its most spiritual location in the country. Evening: We arrive at Zamosc, where we will stay for one night. We recommend taking a short walk around the famous market after the delicious dinner. Excellent in every way- we were so pleased with this tour. Our guide Wladyslaw was terrific. Thanks to Wieslawa for all her planning. I ticked 5 stars for everything but they wouldn’t stay ticked. It was a great experience overall. Prompt, courtious. The driver was really fantastic.